Choose a design from above. Enter 2 lines of text up to 18 characters each, including spaces. Our Personalized Shimmering Love "I DO" Plume Hershey's Kisses Sets are the perfect addition to any engagement party celebration, bridal shower favor bag or wedding reception table! 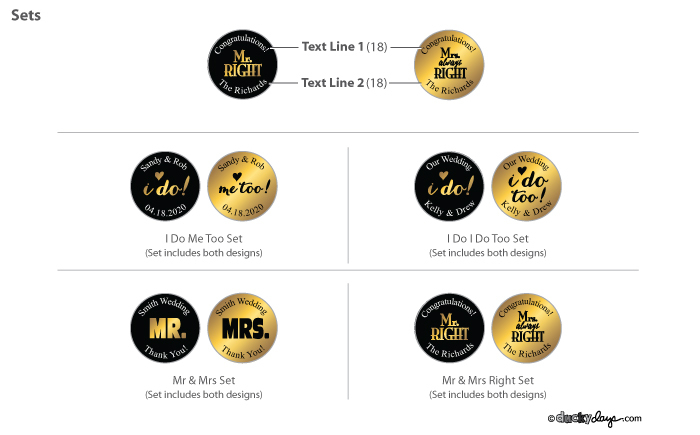 Each Shimmering Love Set includes two designs featured on an "I DO!" plume kiss that is elegantly wrapped in silver and gold heart-patterned I DO foil. Sprinkle these sweet treats on tables or arrange them in unique vases to add a sweet touch to your celebration. However you choose to spread these little favors make sure you have enough - after all one kiss is NEVER enough! Item shipped in insulated cooler pack to keep chocolate safe in transit. Additional shipping charges may apply. We highly recommend choosing Express shipping to guarantee your chocolate arrives safely. Orders shipped via Ground will not be guaranteed.